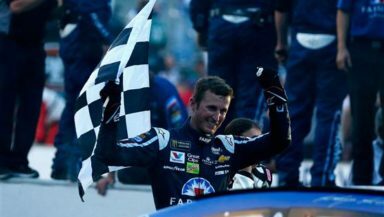 Kasey Kahne, driver of the #5 Farmers Insurance Chevrolet, celebrates winning the Monster Energy NASCAR Cup Series Brickyard 400 at Indianapolis Motorspeedway on July 23, 2017 in Indianapolis, Indiana. Photo by Sean Gardner/Getty Images. It’s been a while since I’ve appeared in these pages. My trip to Martinsville was a disaster (snowmageddon), so next on my schedule was Bristol, which despite gloomy skies, tremendous races happened. The crowd was good, but many wanted to make fun of the crowd. No, the track wasn’t full, but a good 100,000 was there and Kurt Busch outlasted and outran one of NASCAR’s darling young drivers, Kyle Larson to claim victory and qualify for the Playoffs. Darlington is my second favorite track, but I couldn’t get there this year, much to my chagrin. It was a big crowd, and the race was good. Brad Keselowski won the race, teammate Joey Logano was second, all to the glory of Team Penske, and though Larson finished up front, he didn’t’ win, he led the most laps, and then, the atomic bomb hit. It was a shock to everyone when Barney Visser announced that he was closing the doors of Furniture Row Racing, home to Martin Truex Jr., the reigning Cup Champion, at the season’s end. Apparently, this had been planned between FRR and Joe Gibbs Racing all along and probably Toyota Racing Development. Within a day, though there was no formal announcement, it was learned that Truex was moving to a JGR car, the No. 19 previously driven by Daniel Suarez, who had replaced the departing Carl Edwards only a short time ago. Where Suarez will end up, is rumored to be at a satellite team to JGR, but this seems to be a too familiar scenario. Sorry to say, but I imagine Suarez’s star will not move at the rate it was before. So much for diversity. Anyway, the only questions that remain involved Kurt Busch, Jamie McMurray, and probably more changes. I expect Busch and McMurray to stay put, and A.J. Allmendinger to move on from the 47 car. His replacement could be anyone, or someone I don’t know. By the way, Kasey Kahne retired. No one seems to care. I think it’s a great loss, but, it will all work out. I hope. So, we head to Indianapolis, a place the drivers love, but the fans do not. Boring races are the rule, and I imagine the place will look empty, and after two triumphant weekends, this will be a downer, and I hope that’s not the case. It will bring the haters out, but the truth is the field will be set for the Playoffs like it or not. I can’t wait to see what happens. IMO, it’s time for Indy to go away.